We got to go in rooms used for the Harry Potter films! A pub with book quotes on the wall - Pippin: What's that? Merry: This my friend, is a pint. Pippin: It comes in pints? I'm getting one. We took the train out of London on Tuesday morning headed to Oxford. We were all bubbling with excitement about getting to see the gorgeous libraries in a place steeped in history. We started with a tour at the Bodleian Library led by a wonderful volunteer. She talked to us in detail about the building and design of the library and other spaces at Oxford. I was surprised to find out that so many different people all designed one building. As one mason died another was hired on for the job, and they all had vastly different directions and funds. This led to the buildings having inconsistent architecture and constantly changing decoration. Humphrey of Lancaster, 1st Duke of Gloucester was the main benefactor of the amazing academic library in his name. 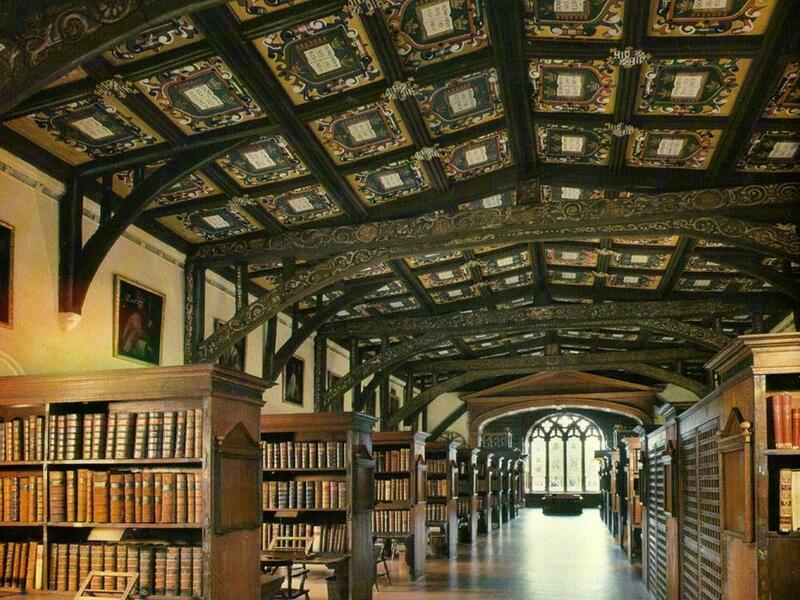 His vast collection diversified the library that had previously been solely theological and changed it into a library that provided for various routes of study at Oxford University. The Royal Family also had an influence on the library, which gave Oxford precedent for royal attentions. The beautiful ceiling in the first room we entered, designed for theological students to take oral exams, includes natural, religious, and familial depictions. I have always loved medieval crests and family emblems, so I loved gazing up at the many varied carvings. Our guide explained that although the buildings have experienced changes and additions, there has been very little damage sustained by the decoration. There are a couple of places where symbols have been broken, but not many. Christopher Wren, who also built St. Paul’s Cathedral, was responsible for some of the most drastic changes, which included reinforcing the arches and adding a door. For Harry Potter fans, this was an exciting room because it was used for filming parts of Hogwarts Castle in the movies. Next we looked at the Parliament Room, designed to create an obvious split between the theological and secular spaces at Oxford, and the court room. The court room began to try cases involving university members, but evolved into mainly a debtor’s court. The court room remained a working court until 1968. The most exciting part of the visit was the unbelievable Humfrey library. All the librarians were sad to hear that from the original Humfrey gift of 281 books and manuscripts, only 5 are left at Oxford. This was due to the 1550s reformation that demanded the destruction of Catholic and superstitious texts. 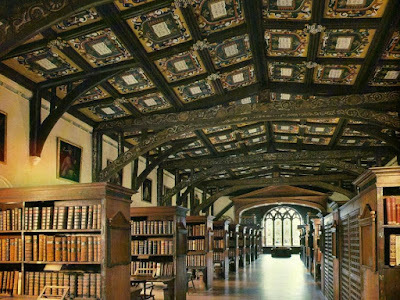 After becoming a prominent figure, Thomas Bodley made it his life’s work to restore the library to its original splendor. Therefore, the Oxford libraries and other buildings sponsored by Bodley are now referred to as the Bodleian. Since the loss of the original Humphrey library, many items have been collected through legal deposit. Oxford is one of six United Kingdom institutions that obtain materials in this manner. After hearing a great deal about the collection we finally got to walk up the stairs to the Humfrey library. As we entered the book-filled space, an atmosphere of history and knowledge wrapped around us. We were able to gaze at the old texts, which are arranged by height in floor to ceiling shelving with a second gallery level. It was wonderful to hear about the first catalog and chains used to keep books from disappearing. The beautifully painted ceiling includes the Oxford crest a motto; an open book with “The Lord is my light” in Latin. This room is magical in a way that only a place full of knowledge can be. Our group had lunch at a lovely little café near the Bodliean, where I had my first cream tea of the trip. It included English Breakfast tea, a scone, clotted cream, and strawberry jam. We then looked through some of the shops in Oxford. I bought an amazing handmade necklace in the shape of a blue leather bound book that includes pictures and names of flower. One of the fun parts of Oxford was looking at the shops selling souvenirs related to Lewis Carroll’s Alice’s Adventures in Wonderland and J. R. R. Tolkien’s The Lord of the Rings. We then made our way to a short tour of Merton College. We were shown the “Mob Quad”, so named for the undergraduates that lived in the surrounding buildings and the small cathedral. The space has seen vast changes since its first building. It was unable to be finished due to lack of funds, so its grandeur seems overboard for its size. Also, much of the architecture and stained glass was changed, broken, or replaced based on the vastly different sympathies of the Protestant Reformation and Victorian era. Our group was very entertained by the dolphin crest used by a prominent donor. The so-called dolphin was actually created by someone who had never seen a dolphin, so it looks more like a scaly sword fish than a dolphin. The library at Merton was amazing to be inside because we were able to walk among the books rather than gaze at them from a distance. There were also two huge globes; one of land and one of the constellations. It was very interesting to see how the map makers had made up their own versions of geography for places they did not know, like Canada. It made these people seem more real and common, rather than bright scholars of their time. This creation of maps also mirrored the dolphin crest we had seen earlier, highlighting how people in history have pretended to know much more than they did. After our tour, we made our way through green gardens to a small stone table supposedly used by J. R. R. Tolkien to write The Lord of the Rings while he was a professor at Merton. We were also able to see the window of his rooms at the college. We ended our day in Oxford at a small pub called The Eagle and Child that boasts as the meeting place of literary minds such as Tolkien and Carroll. It was a fabulous day out! What a beautiful time you are having!